Satellite Prod opens new office in Nice, France for SNG and IP transmissions. Paris, September 2016: Satellite Prod, which provides SNG and live IP services, is expanding in France by basing a DSNG truck in Nice. The company already has offices in Paris, Nantes and Caen. In addition to extending its geographical reach, Satellite Prod is also investing in new facilities. 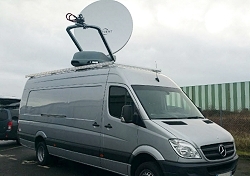 It recently purchased a 4+1 path DSNG/OBVAN to accommodate up to six cameras. Satellite Prod is composed of transmission and video engineers and is specialised in live productions using both SNG uplink equipment as well as IP streaming solutions.